The French Chess Federation (FFE), BP 10054, 78185 Saint Quentin en Yvelines Cedex, FRANCE, under the auspices of the city of Aix‐les‐Bains and the European Chess Union (ECU), is organizing the 12th European Championship which will be held in Aix‐les‐Bains, France, from March 21st (day of arrival) to April 3rd (day of departure) 2011. Opening and closing ceremonies will take place at the Congress Center’s Auditorium, Rue Jean Monard, 73100 Aix‐les‐Bains. The playing venues will be at the Congress Center, Rue Jean Monard, 73100 Aix‐les‐Bains, and Casino Grand Cercle, 200 Rue du Casino, 73100 Aix‐les‐Bains. The 12th European Individual Chess Championship is open to all players representing the Chess Federations which comprise the European Chess Union (FIDE zones 1.1 to 1.10) regardless of their title or rating. There is no limit of participants per federation. The Championship is qualification event for the next World Cup. According to the FIDE Regulations and the decision of the ECU Board, 23 players will qualify. General Prizes amount to 113 700 € and Special Prizes (performance minus rating) are worth 6 300 €. 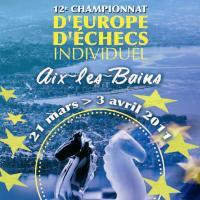 After having been organized in Eastern Europe for last 10 years, the 2011 European Chess Championships will be held in France (first time ever), in Aix-les-Bains, from March 21st to April 3rd. This is the result of many years of tight collaboration between the French Chess Federation and the European Chess Union. This prestigious tournament will be the most important event of the year for us and can be considered as a huge spotlight on our sport. 54 countries, more than 400 players, including the strongest Grandmasters of the world, will offer to chess fans a show never seen before in France! That is why the French Chess Federation sets a very ambitious goal: we would like everybody to keep unforgettable impressions of this event! We want it to be faultless in terms of welcoming and be a good example in terms of conviviality. First of all, we made our choice, together with the Rhône-Alpes Region and the Savoie Departement, in favor of the worldwide known place, famous for its tradition of welcoming foreign visitors and its exceptional environment. The other natural reason is that Aix-les-Bains has already been involved for a long while in organisation of huge chess events and it has also the dynamic image of an “all sports” city. And the last but not the least, is that the French Ministry of Sports and private partners have joined us to give an additional value to the event across France, to create parallel competitions, and to make this European Championship an amazing place for players and visitors! This page does not longer exist.